Added support for secure statistics. Statistics will now display names instead of their ID when available. 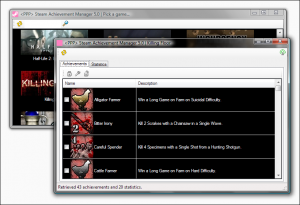 You can download the new version of Steam Achievement Manager on its page. Comment in this post if you’re having issues with the new version. There has not and will not ever be a virus or trojan in SAM downloads provided through my site, if some random obscure virus scanner picks something up, it’s a false positive. Fixes issue with games that have secure achievements unlocked. Fixed issues with crashes occurring when user had a language other than English set for Windows / Steam and certain games. Achievement list will now show the locked version of a icons for locked achievements. Fixed issue with recent Steam update where Picker would claim Steam was not running. Fixed issue where adding a game manually did not work properly. Overhauled how SAM obtains achievement and stat info, now parses the UserGameStatsSchema files found under the Steam directory. The previous entry means that the bugs where stats or achievements were duplicated or missing should now be fixed. Now has a display for stats that indicates if it is increment only or not. API improvements, no longer depends on steam_api.dll. Reset achievement and/or stat support. Other stuff I can’t remember now. There may be an intermittent issue with the Steam UI freezing while / after running SAM (Picker or Game), if that happens, restarting Steam should fix it. Feel free to report issues in comments. This fixes the crash issues introduced with a recent Steam update. Due to lots of people bugging me about it, I’ve added support for editing statistic values to Steam Achievement Manager. Also to address some concerns about people asking about Left 4 Dead achievements. They’re not “persisting” in-game when you unlock them in Steam Achievement Manager because there are statistic values tied to them, and the game verifies these when it lists its achievements. It has nothing to do with SteamCloud (that’s not its purpose!). I picked up a copy of Titan Quest + Titan Quest: Immortal Throne on the current Steam weekend deal, only to find that I couldn’t attempt to refresh the games list for internet games without getting a nice exception dialog. I researched this to find that it seems to be a common issue on Vista SP1, someone had suspected that Titan Quest was creating a raw socket for some reason. That is in fact what it’s doing. Since I am not running the game in administrator mode, the socket creation fails. Since I don’t really like the idea of running Steam and TQ:IT in administrator mode, I looked for a better fix. It makes a call to socket(AF_INET, SOCK_RAW, IPPROTO_ICMP) in Engine.dll. I modified Engine.dll to make it call socket(AF_INET, SOCK_DGRAM, IPPROTO_TCP) instead. I suspect this breaks the ping display in the game list now, but it appears to run just fine now without any exceptions. It’s a two byte fix for Engine.dll, assuming the latest version of Engine.dll for TQ:IT on Steam now (md5 of cf00e85ff32629e4ad7859765722517b), you will want to change offset 0x164A0F to 0x11 (from 0x01), and offset 0x164A11 to 0x02 (from 0x03). GCFScape can be found here.